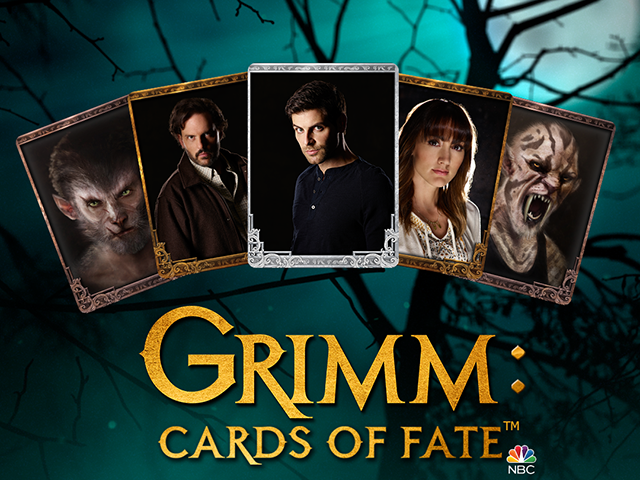 Grimm: Cards of Fate was designed to serve as a bridge between the season five finale of the Grimm television series, which aired in May 2016, and the upcoming sixth season of the show. Midverse Studios and publisher EverDead Studios have officially launched Grimm: Cards of Fate on iOS and Android. The game is based on NBC television series Grimm. Grimm: Cards of Fate was designed to serve as a bridge between the Season 5 finale of the Grimm television series, which aired in May, and the upcoming sixth season of the show. At launch, users can complete quests and collect cards based on past episodes of the show, and they can purchase episodes directly from iTunes or Google Play via links in the app. Once the new season of Grimm debuts, users will also be able to complete in-game puzzles, collect characters and battle creatures based on each new episode of the show as it airs. Each of the game’s episodes is split into multiple mini-games, including card battles, match-three games and hidden object scenes. During card battles, players are challenged to defeat the opponent’s avatar by using attacking cards to eliminate the enemy’s defending cards, as well as to attack the enemy avatar itself. Users can also use potion and equipment cards to affect the battle. Meanwhile, match-three games ask users to create matches with symbols to attack their opponents. In these games, the player’s card and any enemy cards each have a specific symbol attached to them. By creating matches with these symbols, users can deal extra damage to enemies or heal their own character. Finally, hidden object scenes ask players to find groups of hidden objects before time runs out. Users can tap a hint button to shrink the search area, but this also removes time from the clock. Users have a limited number of hearts available during each scene, and they lose hearts as they tap on incorrect items. As players complete mini-games and quests, they’ll receive new cards for their decks, as well as coins to spend on items like card packs in the game’s store. Users can enhance and evolve their cards to increase their stats. In addition, as players collect cards in specific sets, they’ll receive additional cards as rewards. When users are trying to collect specific cards, they can attempt to steal them from other players through card battles. Users can purchase locks to protect individual cards from being stolen. Users can also collect specific cards by spending coins on a spin wheel. Finally, in addition to completing card battles against computer-controlled opponents, gamers can challenge other users in player-versus-player card battles. Our unique watch and play experience means that fans can relive the experience of their favorite episodes and creatures from Grimm. Moreover, when the show is on the air, we will be able to release content related to that episode immediately for a truly unique, integrated transmedia experience. In this way, the mobile game becomes an extension of the show. Grimm: Cards of Fate is available to download for free on the iTunes App Store and Google Play.